Designed for high volume and providing general Strip Cut security, this versatile shredder features Jam Stopper technology, a wide entry mouth to take up to A3 paper and cuts out automatically when the massive 175 litre capacity plastic bin is full. Protect your confidential and valuable information from being stolen by shredding any documents that may put your business at risk from identity fraud. The Rexel Mercury RLWS35 is a multi department shredder designed to for high volume use with multiple users and has a P-2 security level which means that it shreds paper into Strip Cut particles (sized 5.8mm) making it ideal for everyday shredding. By destroying hard copy documents such as bank and credit card statements, customer details and client lists, accounting records, bills, medical records, salary details and human resource records you can protect yourself and your business from the fastest growing fraud in Europe. 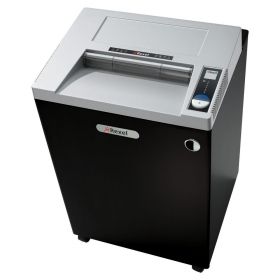 The RLWS35 is a wide entry (mouth size 400mm) shredder that can shred documents in all shapes and sizes including A4, A3 and computer listing paper as well as paperclips, staples, credit cards and CD’s. Engineered for bulk shredding, it can shred up to 39 sheets of 70gsm paper (35 at 80gsm) in a continuous single feed and it features a super large 175 litre large capacity plastic waste bin meaning you rarely have to empty it. Paper jams are avoided, thanks to the anti-jam function which reverses paper out of the shredder when too much is fed in. The front opening door with pull out frame and plastic bin option enables simple and mess free emptying and the shredder cuts off automatically when the bin is full. With a clear, easy to use LED control panel and a safety flap in the feed opening, the stylish RLWS35 is the ideal choice as a desk side shredder for users who require bulk destruction of documents. Weighing 82kg and sized at 970(H) x 640(W) x 590(D)mm, the RLWS35 comes with the extra peace of mind of a 2 year warranty.